Measurement of immunoglobulin-free light chains in serum has recently become possible. These tests are used as an aid in the diagnosis and monitoring of multiple myeloma and related disorders. There are two types of immunoglobulin light chain produced in humans, designated by the Greek letters kappa (κ) and lambda (λ). Comparing the ratio of kappa-to-lambda free-light chains in the serum of an individual with that measured in a number of subjects known to be disease-free indicates whether the individual might have a plasma cell tumour such as multiple myeloma or AL amyloidosis. 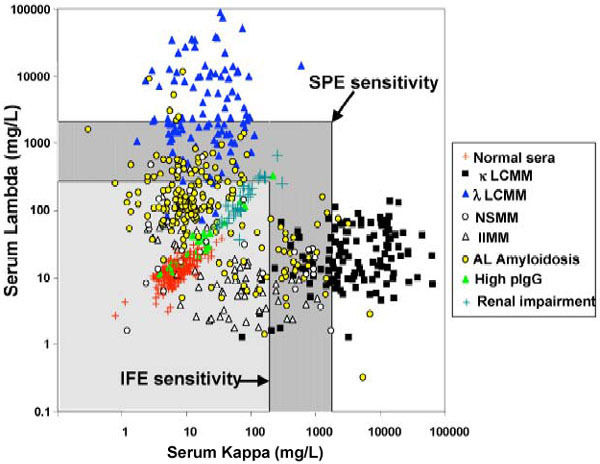 Serum free light-chain assays have been used in a number of published studies which have indicated superiority over the urine tests, particularly for patients producing low levels of monoclonal free light chains, as seen in nonsecretory multiple myeloma and AL amyloidosis. This is primarily because of the re-absorption of free light chains in the kidneys, creating a "threshold" of light chain production which must be exceeded before measurable quantities overflow into the urine. While there are a number of publications indicating that serum free light chain analysis is preferable to urine analysis at diagnosis, there is currently no consensus on whether urine tests for monitoring should be replaced. A series of studies, principally from the Mayo Clinic, have indicated that patients with an abnormal free kappa / free lambda ratio have an increased risk of progression to active myeloma from precursor conditions including Monoclonal gammopathy of undetermined significance (MGUS), Smoldering myeloma and solitary plasmacytoma of the bone. Abnormal free light chain production has also been reported to be prognostic of a worse outcome in multiple myeloma and chronic lymphocytic leukaemia. Light chains are proteins produced by immune cells called plasma cells. Also called kappa and lambda light chains, they link together with other proteins (heavy chains) to form immunoglobulins, or antibodies that target and neutralize specific threats to the body such as bacteria and viruses. Free light chains (FLC) or serum free light chains (SFLC) refer to those that are not part of whole (intact) immunoglobulins and are present in the blood. This test measures the amount of free kappa and lambda light chains in the blood and calculates a kappa/lambda ratio to help detect, diagnose, and monitor conditions associated with an increased production of free light chains. Each type of immunoglobulin is composed of four protein chains: two identical heavy chains and two identical light chains. A particular plasma cell will produce only one type of immunoglobulin. Normally, there is a slight excess of free light chains produced, so low levels of free kappa and lambda chains can be detected in the blood. With a group of conditions called plasma cell disorders (dyscrasias) or monoclonal gammopathies, a plasma cell becomes malignant, dividing uncontrollably and producing a large number of copies (clones) of itself that crowd out other cells in the bone marrow. Since the clones come from a single plasma cell, they produce large amounts of the same type of abnormal monoclonal immunoglobulin (M-protein). This may take the form of an intact immunoglobulin, a light chain, or rarely a heavy chain. Excess light chain production may be seen with any of the plasma cell disorders, such as multiple myeloma, MGUS (monoclonal gammopathy of unknown significance, a condition that may progress to multiple myeloma), and monoclonal light chain (primary) amyloidosis. In the beginning, these conditions may cause few symptoms, but as time progresses, they can cause bone pain and fractures, anemia, fatigue, weight loss, and kidney dysfunction. NOTE: If undergoing medical tests makes you or someone you care for anxious, embarrassed, or even difficult to manage, you might consider reading one or more of the following articles: Coping with Test Pain, Discomfort, and Anxiety, Tips on Blood Testing, Tips to Help Children through Their Medical Tests, and Tips to Help the Elderly through Their Medical Tests. Another article, Follow That Sample, provides a glimpse at the collection and processing of a blood sample and throat culture. Serum free light chain (SFLC) testing is ordered to help detect, diagnose, and monitor plasma cell disorders (dyscrasias), including multiple myeloma and primary amyloidosis, and to monitor the effectiveness of treatment. Light chains are proteins produced by plasma cells. They are used to assemble immunoglobulins (Ig), antibodies that target and neutralize specific threats to the body such as bacteria and viruses. Two light chains and two heavy chains combine to form an immunoglobulin (IgG, IgM, or IgA). With a group of conditions called plasma cell disorders or monoclonal gammopathies, a plasma cell becomes malignant, divides uncontrollably, and produces large amounts of an abnormal monoclonal immunoglobulin (M-protein). This protein may take the form of an intact immunoglobulin or of one of its component parts – a kappa or lambda light chain, or rarely, a heavy chain. Traditionally, plasma cell disorders have been diagnosed using serum and urine protein electrophoresis tests (SPEP/UPEP), followed by immunofixation electrophoresis (IFE) tests to determine which immunoglobulin is present in excess. Blood tests may also be ordered to measure levels of intact immunoglobulins (IgG, IgM, IgA). Serum free light chain testing provides complementary information. It can detect the low levels of free light chains that are sometimes all that is produced by a plasma cell disorder and can detect changes in the ratio of kappa and lambda production, which indicate an excess of one clone of plasma cells. Initially, serum free light chain testing is ordered along with a serum protein electrophoresis test to detect abnormal monoclonal protein (M-protein) production and to calculate a kappa/lambda free light chain ratio. If the protein electrophoresis test is abnormal, then an immunofixation electrophoresis test is performed to determine which immunoglobulin is present in excess. If a plasma disorder is detected, then the free light chain test may be ordered periodically to monitor the condition and to evaluate the effectiveness of treatment. Immunonephelometric measurement of serum free light chains are a reliable method for follow up of patients with light chain secreting monoclonal gammopathies. ● Blood--anemia and frequent infections due to low levels of red and white blood cells; plasma cells crowd out the other types of cells in the bone marrow, leading to a decrease of RBCs and WBCs. ● Kidneys--production of abnormal amounts of light chains can lead to increased light chains in the urine (Bence-Jones protein); these proteins can lodge or deposit in the kidneys, causing damage. When a light chain disorder is diagnosed, the test may be ordered periodically to monitor the condition and to evaluate the effectiveness of treatment. Free light chains will normally be present in the blood at low levels, with a kappa/lambda ratio of approximately 0.26 to 1.65. Increased kappa free light chains and an increased kappa/lambda ratio may be seen with plasma cell disorders that produce excess monoclonal kappa light chains. Increased lambda free light chains and a decreased kappa/lambda ratio may be seen with plasma cell disorders that produce excess monoclonal lambda light chains. In general, significantly increased free light chain production and an abnormal kappa/lambda ratio indicate a poorer prognosis and an increased risk of disease progression. When the test is used to monitor a known plasma cell disorder, a decrease in the quantity of excess light chain and a more normal kappa/lambda ratio indicates a response to treatment. Increased free light chains with a normal serum free kappa/lambda ratio may be seen with people who have some degree of kidney dysfunction that is unrelated to a plasma cell disorder. Decreased free light chains with a normal kappa/lambda ratio may be seen with a disorder that suppresses bone marrow cell production. With suspected primary amyloidosis, an increase in serum free light chains with an abnormal kappa/lambda ratio may suggest that amyloidosis is the cause of symptoms. However, a biopsy of affected tissue is the primary means of establishing the diagnosis. Monoclonal gammopathy of undetermined significance (MGUS) is the most common plasma cell disorder and it usually does not cause symptoms. A percentage of people with MGUS will later develop multiple myeloma. This risk is increased in those with increased free light chain production and an abnormal kappa/lambda ratio. Serum free light chain analysis accelerates the detection of treatment response because the free light chains have a much shorter half-life (3-5 hours) than intact immunoglobulins (about 21 days). Although it is traditionally used for light chain-only plasma cell disorders, the test has increasingly been used for treatment monitoring of myelomas that produce intact immunoglobulins (e.g., IgG, IgA) as well.